*No reply was received to the previous letter. 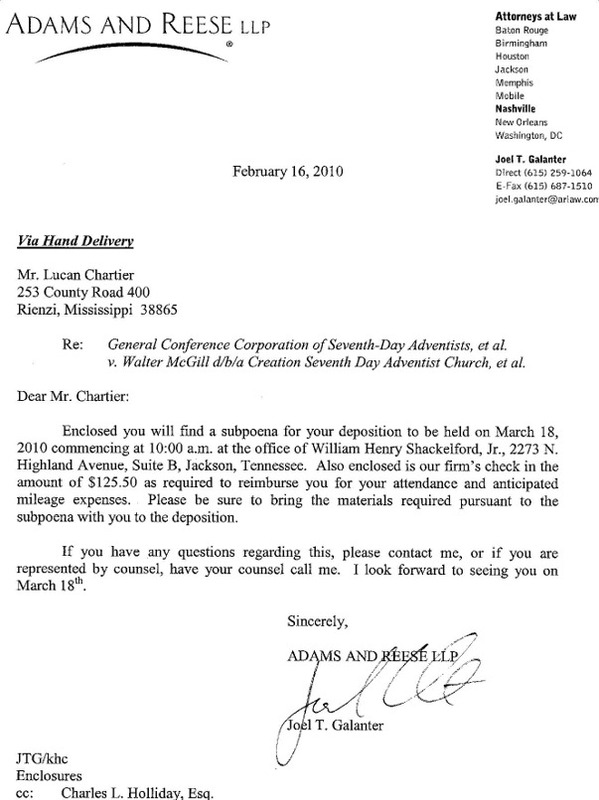 On March 12th, Lucan learned that Mr. Galanter had asked Mr. Holliday, Pastor McGill's attorney, if he knew whether Lucan intended to appear at the deposition. 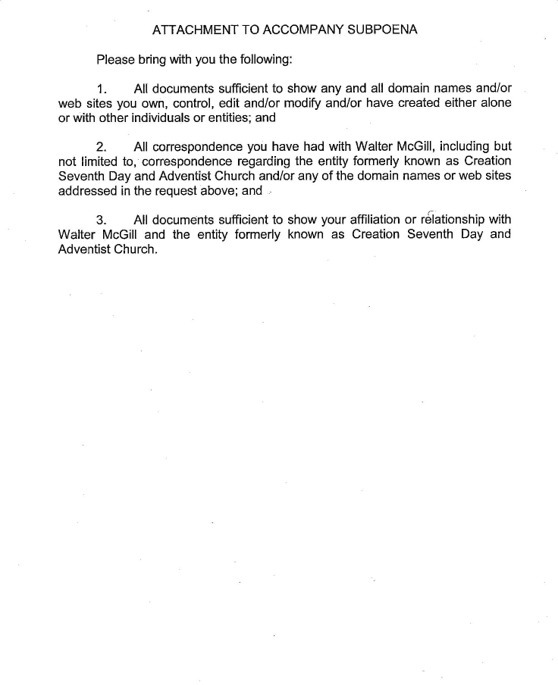 Several years ago when I was 17 years of age, I first found the message of the Creation Seventh Day Adventist Church online, and shortly thereafter embraced it fully. With some prayer and study, I came to the conclusion that Yahweh wished me to move to Tennessee to assist with the congregation in Guys and learn from those present. This was entirely at odds with the plans and expectations for my life that I had laid beforehand, but I quickly surrendered them in light of God's instructions. When I first informed my father of my decision, he cynically commented that it seemed to him that people "always happened to claim God told them to do what they wanted to do themselves." I remember the incredulity I viewed that statement with at the time, as Tennessee was most definitely the last place on earth I had ever intended to move to! 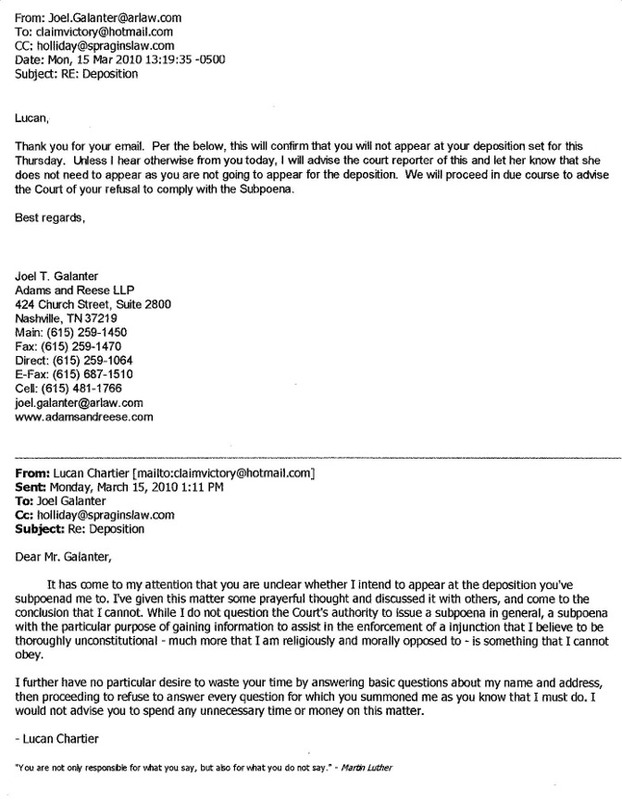 There are some who may wonder – and some who indeed have asked – why I have chosen not to attend the deposition at all rather than attending to be in compliance with the Court, and stating that I cannot answer the questions posed to me. Much like my move to Tennessee, this decision is not one that I entered into lightly or based upon my own desires. As I stated in my first letter to Mr. Galanter, my first reaction to the subpoena was to fight it by every legal means possible, be it technicality or otherwise. Yet I was cautioned against this both by my brethren and my Father upon earnest prayer. When I realized what I was to do was simply to be as a lamb to the slaughter, allowing them to do with me as they wish in response to my refusal to assist them, my first inclination was likewise to appear at the deposition to be in compliance with the Court inasmuch as I could. I have, and have always had, a deep respect for the authority and workings of the justice system. I would have, were it not for the expectation and realization of this current persecution, sought to become a lawyer. As young men count dreams, I had dreamt of one day serving as a Justice for the Supreme Court, though rarely have I voiced it due to the unlikelihood of such an appointment. And with my understanding of Romans 13, it appeared to me that all aspirations aside, I am required to honor the rulers of the land to the very point it violates my conscience – and I certainly have no conscientious objection to the concept of the Court issuing a subpoena in general. 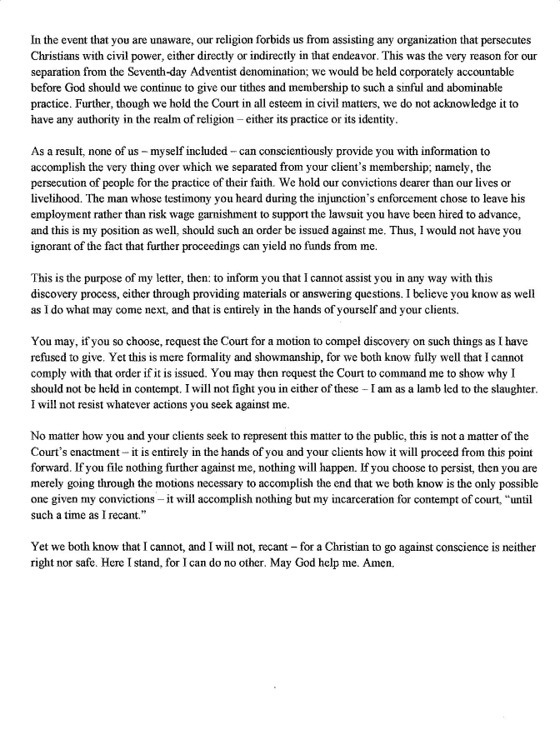 Now, while I have had no illusions regarding the fact that my faith would eventually bring me into conflict with the Court's rulings, my initial response was that the principle of the matter requires me to comply as long as I can with the orders of the Court. Paul did, after all, appear to defend himself before the rulers. So why, then, am I not appearing? Much like my move to Tennessee, my Father has instructed me in a way very contrary to that which I am disposed to go in. As Martin Luther once said, "God does not guide me, He pushes me forward. He carries me away. I am not master of myself. I desire to live in repose; but I am thrown into the midst of tumults and revolutions." I have come to realize that there is a very distinct difference between the situation of Paul and the situation I am now facing. There is a difference between Luther appearing at the Diet and the summons given to me now, and this is that difference: In every age, when the saints have been called to appear and defend their faith before the rulers of the State, they have done so fearlessly and eloquently – just as we have done up to this day. What is demanded of me now is not, however, a defense or apology for my faith. What is demanded of me is compliance and assistance in an inquisition that has already been set into motion, and no true Christian has ever complied with such a demand, regardless of the authority issuing it. When the Courts seek information to make a proper and informed decision as to the liberty of God's people, it is our duty to speak clearly, honoring the Court in all ways due it. Yet when the Courts decide to deny that liberty and deem those who practice their faith to be outlaws, where can righteous compliance be shown in the annals of sacred history? Paul appeared, yes – to defend the faith. 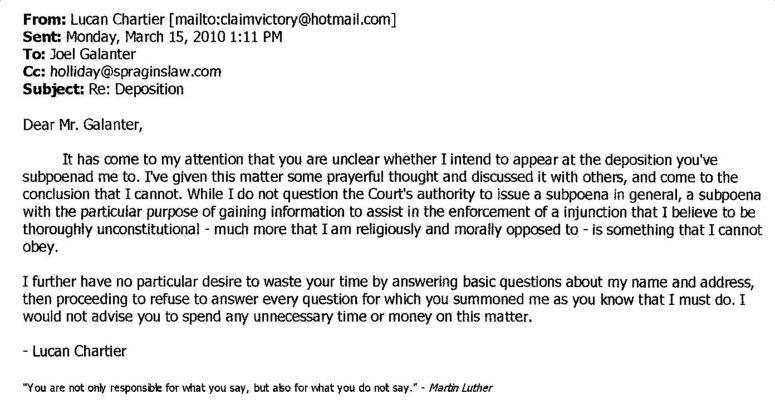 Luther appeared, yes – to answer for his doctrine. Were I called to answer for my faith, I, too, would appear and give what reasoning I could in obedience to the Court. What is being demanded by the Courts presently is not an answer or an apology for our faith, however – this has been made, and firmly rejected. What I am now being faced with is not the Diet, it is the Inquisition, wherein those suspected of heresy are to be rounded up for questioning so that the heretics may be sought out and punished. The time for testimonies has ended – they now seek only compliance. While I do not question the authority of the Court to issue a subpoena, I outright deny its authority to do so in order to persecute men for their faith. 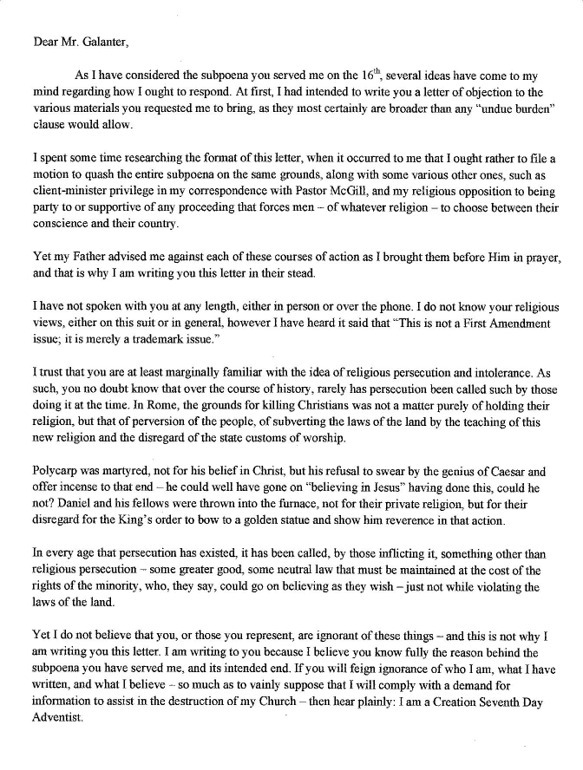 My Father has shown me that I cannot answer this summons any more than a faithful Christian could comply with a letter, no matter how politely worded, to speak with the Inquisitors during the dark ages. Yet were the Inquisitors not acting with the authority of the State? Would it have been safe for a Christian to go and appear at their tribunal in order to refuse information? But let it not be said that the sole responsibility rests upon the Court. The Court itself does not generally issue a subpoena – attorneys in a lawsuit are invested with a certain authority by the Court so that they may subpoena whomever they wish if they believe them to be useful to their case, and that with the backing of the Court. 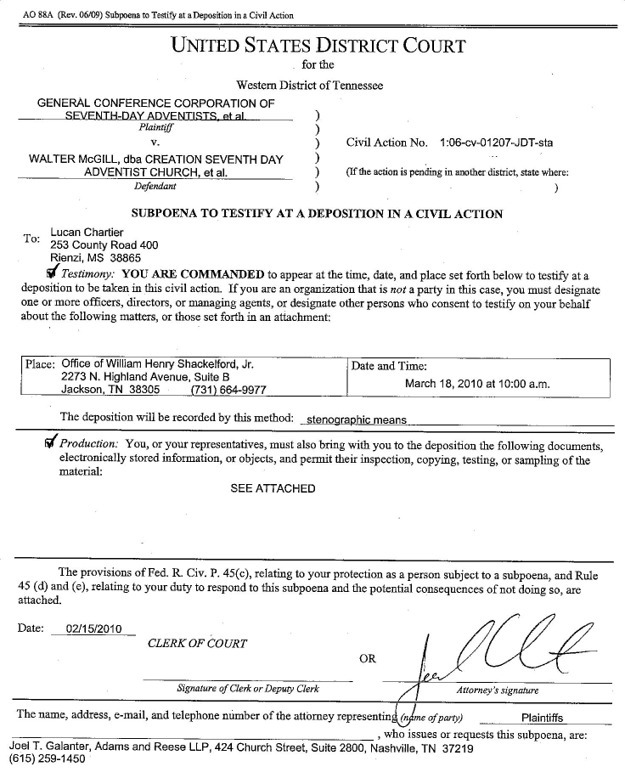 The subpoena itself is issued by the attorney in question, acting on behalf of those he represents. It is of no consequence to the Court if it is complied with, and indeed the Court would remain unaware of noncompliance if the issuing attorney did not complain and seek its enforcement. In other words, it is entirely at the discretion of the attorney and his clients whether they will seek to have the Court punish the individual in question for noncompliance. The Court is merely a tool in their hands at every point. 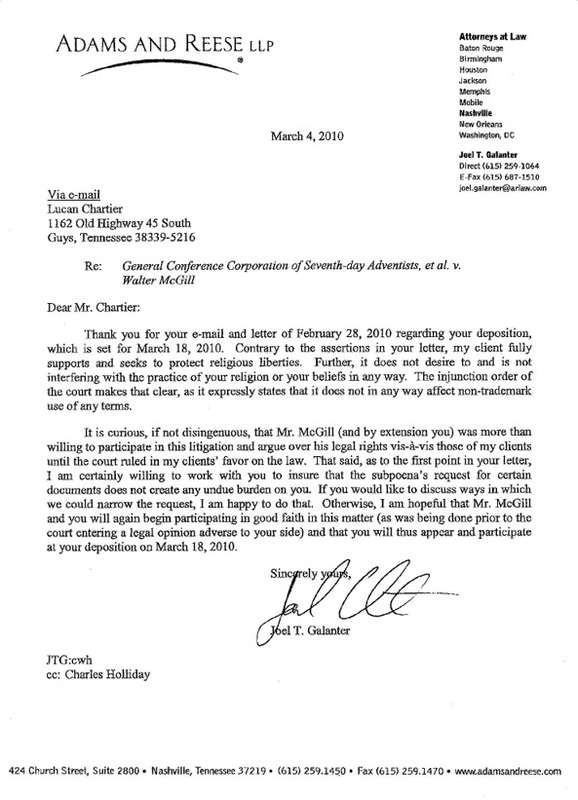 In this case, it is entirely at the discretion of the General Conference of Seventh-day Adventists and their attorney, Mr. Galanter, if they will request the Court to use force in response to my inability to comply with their demands. In a standard lawsuit the purpose for this is to coerce the person to comply with the demand for information, yet both the General Conference and Mr. Galanter are keenly aware that our convictions are not open to revision upon imprisonment. As a result, it is merely a vengeful and cruel desire to see their enemies punished that leads to this outcome, and Mr. Galanter has indicated that he and his clients will pursue it gladly. Under no circumstances will punishment yield information, compliance, or funds from me. Either they do not believe this to be true (and believe it would be justifiable to put a man in prison until he gives up his faith), or they do not truly care, and wish to punish heretics for the sake of silencing their voices – by whatever means may be necessary. In either event, let it be clear: From the moment the subpoena for my deposition was issued, this has been the expected end. It is known that I cannot assist in this work, and the only reason for making such a request would be to bring an accusation to the Court, just as the Chaldeans true motive for suggesting a law barring prayer to any but the King was solely to accuse Daniel. Were I to show up in compliance, it would merely prolong the inevitable, as I have no legal grounds to refuse to give them the information they seek against my brethren. And so here I stand, awaiting the wrath of the beast and the ire of the dragon. I do not doubt that, as many before me, I will be accused of stubbornness and impulsiveness – yet let it not be thought this was my impulse. 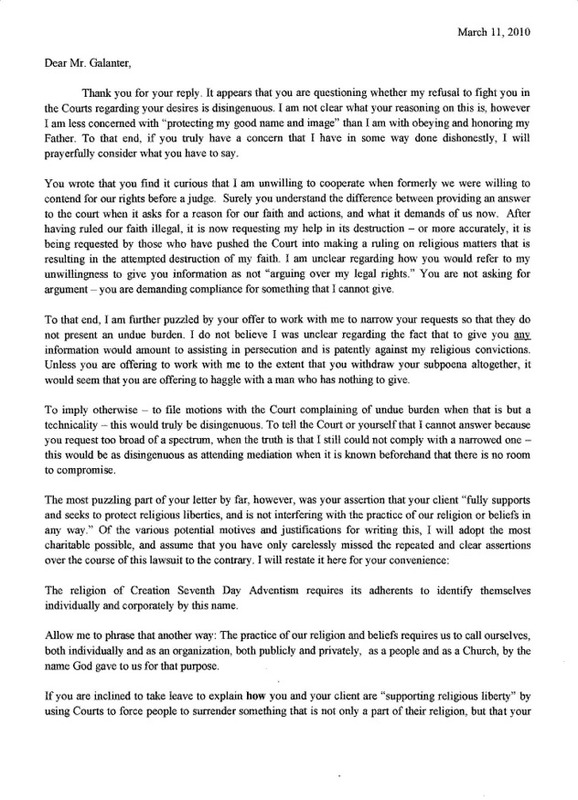 My conviction is that I cannot assist a Court in persecuting men for obedience to their faith, nor acknowledge their authority to do so to the least extent. As many times before, my convictions have lead me in a path that I myself would not have chosen, yet I am blessed to be in the path that Yahweh is leading on, and proud to be in the path that men more qualified than myself have walked down before me. 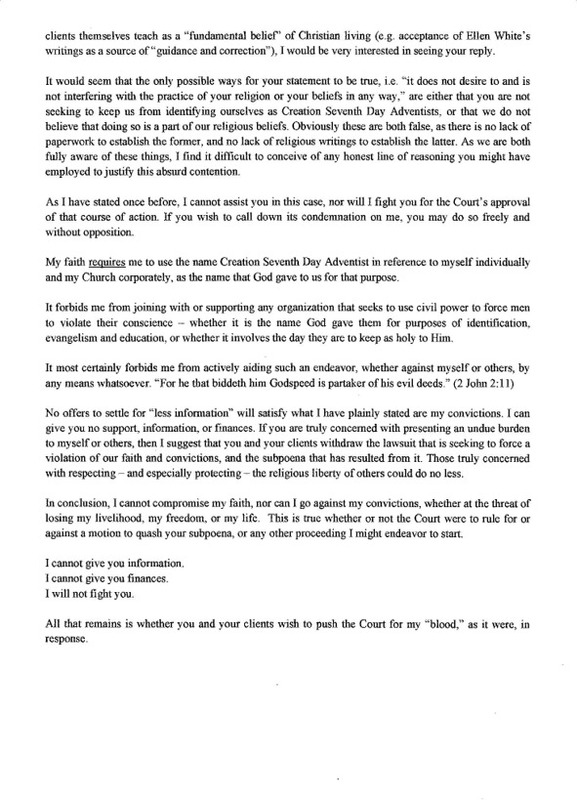 I am truly sorry that I have been put into the position where my faith must conflict with the Court system, and cause me to render it disobedience. It is not my desire to dishonor the authority of the Court or the rulers of the land in any way. But most of all, I am sorry I have been put into this position – of choosing between my God and my country – by men claiming to be Christians, who say they are acting on behalf of Him of whom it is written "a bruised reed shall he not break, and the smoking flax shall he not quench." Yet in this as all things, I must obey God rather than men.